Journal of Nanjing Agricultural University, 2019, 42(2): 382-388. 何佳闻, 何春霞, 郭航言, 等. 5种秸秆生物炭吸附亚甲基蓝及其性能对比研究[J]. 南京农业大学学报, 2019, 42(2): 382-388. 通信作者：何春霞, 教授, 博导, 研究方向为生物质复合材料, E-mail:chunxiahe@tom.com. Abstract: [Objectives] Methylene blue is widely used in chemical indicators, dyes, biological dyes and pharmaceuticals. It will produce a large number of organic dye wastewater in the process of printing and dyeing industry and bring huge environmental risks. 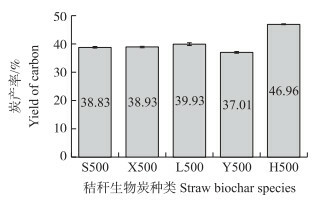 [Methods] Five kinds of biochar(rice straw, corn straw, wheat straw, peanut straw and reed straw) were prepared at 500℃ by the method of oxygen limiting and temperature control. The microstructure, functional group and element of biochar were characterized by scanning electron microscopy, Fourier transform infrared spectroscopy(FTIR) and X-ray diffraction(XRD). The adsorption experiments of methylene blue solution by five kinds of straw biochar were carried out, and the properties of five kinds of straw biochar adsorbed methylene blue solution were compared and analyzed. [Results] Rice straw, wheat straw and reed straw had round hole microporous structure, and corn straw and peanut straw had parallel wall microporous structure. The FTIR spectra of five kinds of straw biochar contained polar groups and aromatic structures. The main peak of the XRD patterns was found to be 2θ was between 20.8° and 28.1°, indicating it was an amorphous structure. pH and the increase of straw biochar input enhanced the adsorption capacity. The adsorption kinetics conformed to a pseudo-second-order kinetic model, and the adsorption isotherm accorded with the Langmuir model. The adsorption capacity of methylene blue by wheat straw biochar was the highest, which was 27.82 mg·g-1. The maximum theoretical adsorption capacity of rice straw and reed straw biochar were 27.28 mg·g-1 and 22.72 mg·g-1, respectively. The adsorption capacity of peanut straw and corn straw biochar to methylene blue was poor. [Conclusions] Among the five kinds of straw biochar, the wheat straw had good surface characteristics and the ability to adsorb methylene blue. It is the preferred material for the adsorption organic contaminants. 图 1 5种秸秆生物炭在500 ℃下热解的炭产率 Fig. 1 The five kinds of straw biological pyrolytic carbon yield under 500 ℃ S500:水稻秸秆生物炭Rice straw biochar; X500:小麦秸秆生物炭Wheat straw biochar; L500:芦苇秸秆生物炭Reed straw biochar; Y500:玉米秸秆生物炭Corn straw biochar; H500:花生秸秆生物炭Peanut straw biochar.下同。The same as follows. Warnock D D, Lehmann J, Kuyper T W, et al. Mycorrhizal responses to biochar in soil-concepts and mechanisms[J]. Plant and Soil, 2007, 300(1/2): 9-20. 简敏菲, 高凯芳, 余厚平. 不同裂解温度对水稻秸秆制备生物炭及其特性的影响[J]. 环境科学学报, 2016, 36(5): 1757-1765. Jian M F, Gao K F, Yu H P. Effects of different pyrolysis temperatures on the preparation and characteristics of bio-char from rice straw[J]. Acta Scientiae Circumstantiae, 2016, 36(5): 1757-1765 (in Chinese). 慈金娜, 陈光. 三种改性玉米秸秆对亚甲基蓝吸附性能的影响[J]. 吉林农业大学学报, 2016, 38(5): 571-578, 586. Ci J N, Chen G. Adsorption performance of methylene blue by three kinds of modified corn straw[J]. Journal of Jilin Agricultural University, 2016, 38(5): 571-578, 586 (in Chinese with English abstract). 黄毓颖, 李坤权, 姚文, 等. 碳酸氢钾活化制备水稻秸秆炭孔结构的影响因素及吸附性能[J]. 环境化学, 2018, 37(3): 569-575. Huang Y Y, Li K Q, Yao W, et al. Investigation on the influencing factors of pore structure on rice straw activated carbon with KHCO3 and its adsorption ability[J]. Environmental Chemistry, 2018, 37(3): 569-575 (in Chinese with English abstract). Batzias F, Sidiras D, Schroeder E, et al. Simulation of dye adsorption on hydrolyzed wheat straw in batch and fixed-bed systems[J]. Chemical Engineering Journal, 2009, 148(2/3): 459-472. 陆海楠, 胡学玉, 刘红伟. 不同裂解条件对生物炭稳定性的影响[J]. 环境科学与技术, 2013, 36(8): 11-14. 张明月, 李锋民, 卢伦, 等. 芦苇生物炭对亚甲基蓝的吸附特性研究[J]. 中国海洋大学学报(自然科学版), 2016, 46(12): 96-103. Zhang M Y, Li F M, Lu L, et al. The adsorption research of biochars prepared from common reed on methylene blue[J]. Periodical of Ocean University of China, 2016, 46(12): 96-103 (in Chinese with English abstract). 季雪琴, 吕黎, 陈芬, 等. 秸秆生物炭对有机染料的吸附作用及机制[J]. 环境科学学报, 2016, 36(5): 1648-1654. Ji X Q, Lü L, Chen F, et al. Sorption properties and mechanisms of organic dyes by straw biochar[J]. Acta Scientiae Circumstantiae, 2016, 36(5): 1648-1654 (in Chinese with English abstract). 朱灵峰, 何怡雪, 耿悦, 等. 还原剂改性生物炭吸附亚甲基蓝的动力学[J]. 江苏农业科学, 2017, 45(9): 232-234. Zhu L F, He Y X, Geng Y, et al. Kinetics of adsorption of methylene blue by biochar modified by reductant[J]. Jiangsu Agricultural Sciences, 2017, 45(9): 232-234 (in Chinese with English abstract). Ma F.Mechanisim and test research on peanut straw stalk feed molding[D].Shenyang: Shenyang Agricultural University, 2017(in Chinese with English abstract). 杨选民, 王雅君, 邱凌, 等. 温度对生物质三组分热解制备生物炭理化特性的影响[J]. 农业机械学报, 2017, 48(4): 284-290. Yang X M, Wang Y J, Qiu L, et al. Effect of temperature on physicochemical properties of biochar prepared by pyrolysis of three components of biomass[J]. Transactions of the Chinese Society for Agricultural Machinery, 2017, 48(4): 284-290 (in Chinese with English abstract). 刘丁宁, 何春霞, 常萧楠, 等. PVC/秸秆类纤维复合材料性能[J]. 工程塑料应用, 2016, 44(10): 6-11. Wei S Y.Influence of biomass feedstocks and pyrolysis temperatures on physical and chemical properties of biochar[D].Beijing: University of Chinese Academy of Sciences, 2017(in Chinese with English abstract). 徐仁扣, 赵安珍, 肖双成, 等. 农作物残体制备的生物质炭对水中亚甲基蓝的吸附作用[J]. 环境科学, 2012, 33(1): 142-146. 杨勇辉, 孙红娟, 彭同江. 石墨烯的氧化还原法制备及结构表征[J]. 无机化学学报, 2010, 26(11): 2083-2090. Yang Y H, Sun H J, Peng T J. Synthesis and structural characterization of graphene by oxidation reduction[J]. Chinese Journal of Inorganic Chemistry, 2010, 26(11): 2083-2090 (in Chinese with English abstract). Keiluweit M, Nico P S, Johnson M G, et al. Dynamic molecular structure of plant biomass-derived black carbon(biochar)[J]. Environmental Science & Technology, 2010, 44(4): 1247-1253. 林肖庆, 吕豪豪, 刘玉学, 等. 生物质原料及炭化温度对生物炭产率与性质的影响[J]. 浙江农业学报, 2016, 28(7): 1216-1223. 孟梁, 侯静文, 郭琳, 等. 芦苇生物炭制备及其对Cu2+的吸附动力学[J]. 实验室研究与探索, 2015, 34(1): 5-8, 17.